This Norse cross from 900AD - 1000AD is a tapering pillar with pieced cross head ring. 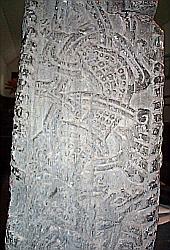 The shaft is decorated with Scandinavian dragons in Mannen style, their tails and limbs interlaced. 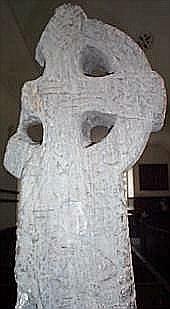 The inscriptions as been translated as 'Thorleif erected this cross to the memory of Fiac his son, brother's son to Hair. '.